Basement Decisions | Yobot Inc. I like to tackle problems by avoiding them completely. It’s a technique that’s served me well throughout the years, and really, I think, quite highly evolved. A LOT of decisions have to be made when you own a house – and the decisions are expensive ones that we have to live with for quite a while. I feel like avoiding this issue – maybe if I never go down to the basement again, I can pretend it’s not there. Oh wait, the laundry is down there. 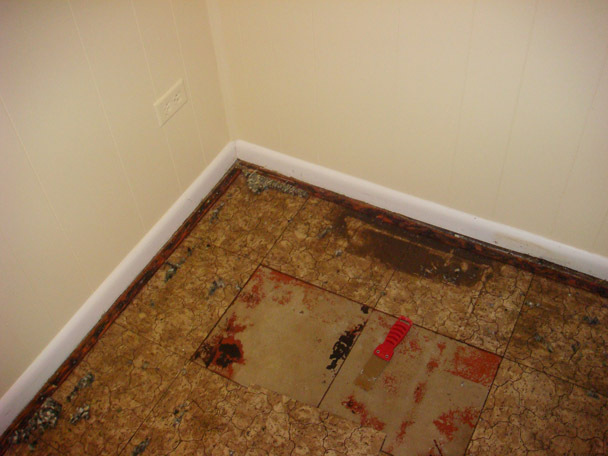 Or maybe we should just paint and seal the basement floor – oh wait – the glue from the old floor tile is still there. Stupid glue. And what about painting the walls? While the room is empty, should we paint the pale yellow basement walls to a more Pam/Robert-y color? And what color would work best with our giant couch? And what should we call this room when it’s finished? Rompus Room? Recreation Room? Money Pit? Family Room? Land of Flooded Waters? or just plain old Basement? See? Lots of basement decisions to be made. Paint the concrete! Check out the link above. There are a zillion ways to paint it…may options…just like walls…faux finishes, geomaetric shapes, etc. Seal w/ a thin layer of urethane or something and you have a happenin’ floor. Then throw down a cozy rug and voila! Lots easier to clean up if the basement leaks again.